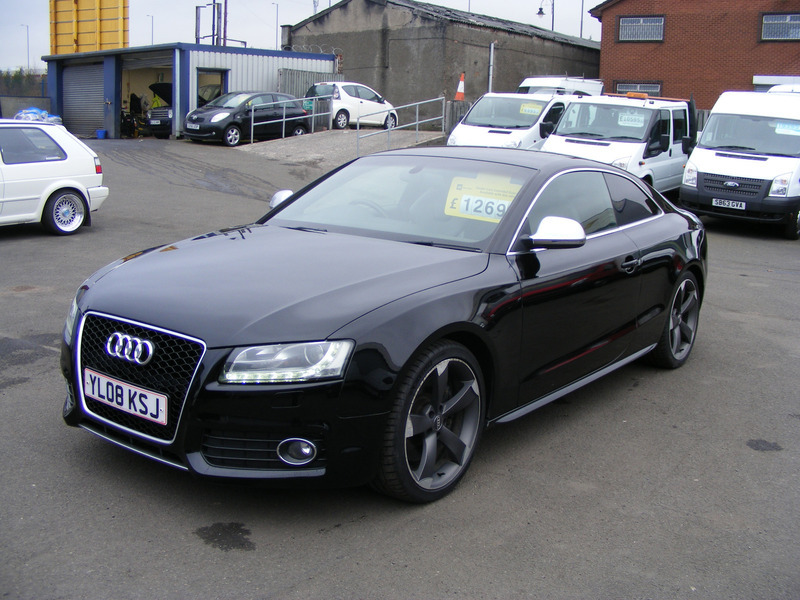 This stunning Audi A5 S5 V8 Quattro has a 6 stamps in the service book and will come with a full Service, 12 Months MOT, and 12 months AA breakdown cover and a full valet before collection. Auto boot lid opening, Colour driver's information system display, Rear acoustic parking system, service interval indicator, Servotronic speed related PAS. Exterior Features, Aluminium door mirror housings, Aluminium window surround, Automatic headlights + automatic windscreen wipers, Body colour bumpers, Electric front windows, Front fog lights, Heated electric door mirrors, Platinum grey front grille, S body styling, Twin chrome exhaust tailpipes x2, Xenon headlights including washers + auto range adjustment. Interior Features, 'S' instrument dials, 3 spoke sports leather multi-function steering wheel, Adjustable steering column, Aluminium scuff plates, Automatic tri-zone climate control, Black headlining, Electric front seats, Front centre armrest, Front head restraints, Front sports seats including electric lumbar support, Isofix front passenger and rear seat preparation, Rear armrest, Rear headrests, Split folding rear seat, Through load facility with removable ski bag. Safety, ABS, Black painted brake calipers, Driver/Front Passenger airbags, ESP + traction control, First aid kit, Front passenger airbag deactivation, Side airbags, Warning triangle. Security, Anti theft system, Immobiliser, Locking wheel bolts, Remote central locking.